This week’s race was just about as surprising as the parallel European road race Paris-Nice: both saw cancellations of summit finishes, both featured unexpected time trial successes, and both had general classification contests that ended up coming down to only a few seconds on the last day. All in all, it would be hard to argue that Tirreno-Adriatico was anything other than the shadow of its more exciting older brother this week, but nevertheless there’s plenty to look back over. 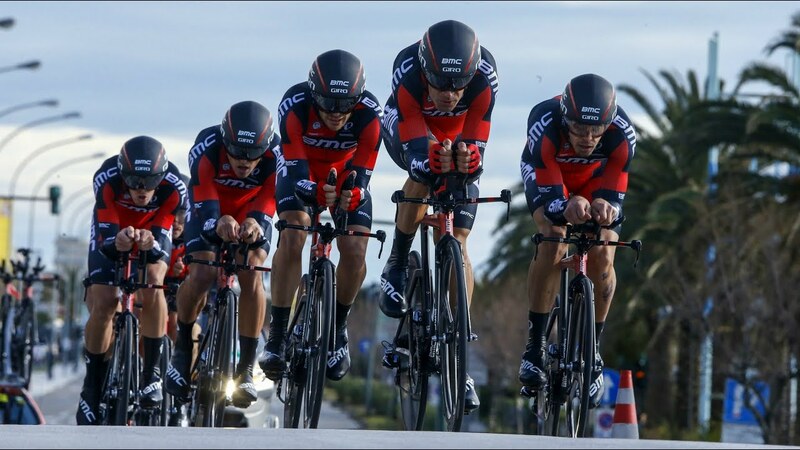 The opening Stage 1 team time trial in Lido di Camaiore didn’t go entirely off-script, with the pre-race favourites Team BMC taking first place by 2 seconds over Etixx-Quickstep. But third on the day, after an astounding early performance, were FDJ, and very few people had expected that result. It’s true that FDJ have been working hard on their (previously lacklustre) time trial skills, and they had such handy forces as Johan Le Bon and Alexandre Geniez on their side, but for them to have toppled the might of teams like Tinkoff in a team time trial is unprecedented, and spells out big things to come from the French squad. The other surprise on day one was the pretty miserable performance from Movistar, who never quite found their rhythm and ended up in tenth, 29 seconds off BMC’s pace. Regrettably, Cannondale’s squad suffered a crash whilst out on the course, and they came across the line over two minutes down. Rigoberto Uran’s G.C. dreams were dashed from day one. Stage 2 gave the riders a nice kick up to the line, and this year’s usual suspects didn’t disappoint. After a battle for positions coming up the climb to Pomarance, it was a desperate Movistar who attacked first, with Giovanni Visconti going long. His move didn’t stick, and the next big shake up — and the decisive move — came with fewer then 3km remaining, from Etixx’s Zdeněk Štybar. Stybar went long and quickly found a tenuous gap of just a couple of seconds on what was by now a depleted chasing group. Vincenzo Nibali took it upon himself to chase, but even the mighty Italian couldn’t pull back Štybar, who got his first big win of the year. Nibali was swamped in the sprint for second, which went to Peter Sagan, followed by Edvald Boasson Hagen. Bad placement on the last turn meant that Greg Van Avermaet, who is great for a finish like this, slipped down to seventh. Cannondale’s new signing Simon Clarke got in a great performance, sprinting for fourth, and is proving that he has what it takes to compete for wins as well as work as a domestique. 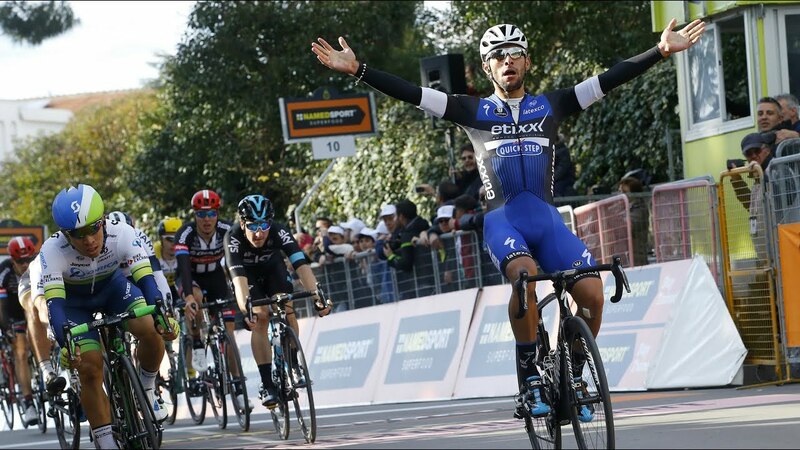 Stage 3 brought with it the first bit of sprint action of this year’s Tirreno-Adriatico. However, the uphill sprint to the line would make it difficult for the pure sprinters such as Mark Cavendish and Elia Viviani, and it was clear that the former wasn’t feeling it today, as he was pulling for his teammate Edvald Boasson Hagen at the front as the peloton thundered under the flame rouge. In the sprint, Sagan was well placed but couldn’t find an opening, and we were looking at Elia Viviani for Sky, Caleb Ewan for Orica, and Fernando Gaviria for Etixx. Viviani came shooting out of the pack on the far side, but he couldn’t match the pace of Ewan or Gaviria, who were without rivals on the day. Fernando Gaviria hit the front from around 250 metres to go, taking an outside line around the huge final bend, but still managed to out-sprint the rest of the field. Ewan was a close second, and between them it looked like a glimpse of the future for professional sprint cycling. Truly a stunning performance. After Stage 4‘s morning break were caught with 31km remaining, the race came down to a second attacking group late in the proceedings, which comprised: Matteo Montaguti, Jan Bakelants, Daniel Moreno, Natnael Berhane, Salvatore Puccio, and Steve Cummings. Cummings, by all standards a powerful rider, benefited from something of a free ride in the group: the chasing pack had a well-placed Edvald Boasson Hagen in its ranks, and everyone knew Dimension Data would be happy if the break was reabsorbed. Sagan had also made an attempt at a late attack, but it was ill-timed and ill-thought out, being a flat, nondescript road 9km from the finish, and, with no one to join or work with him, he was reeled in sharpish. So it was that Steve Cummings had fresh enough legs to attack the group with 3.5km remaining. He only very slowly crept away at first, as Montaguti did all he could to hold the Briton’s wheel, but, as the cliché goes, ‘the elastic snapped’, and there was no bringing back Cummings. He charged for the line, and had an abyssal gap of 13 seconds by the time he hit the line in Foligno. He politely waved to acknowledge the victory but, in the post-race interviews, he was rather sweetly embarrassed to have won, in lieu of his teammate Boasson Hagen. Modesty maketh the gentleman. 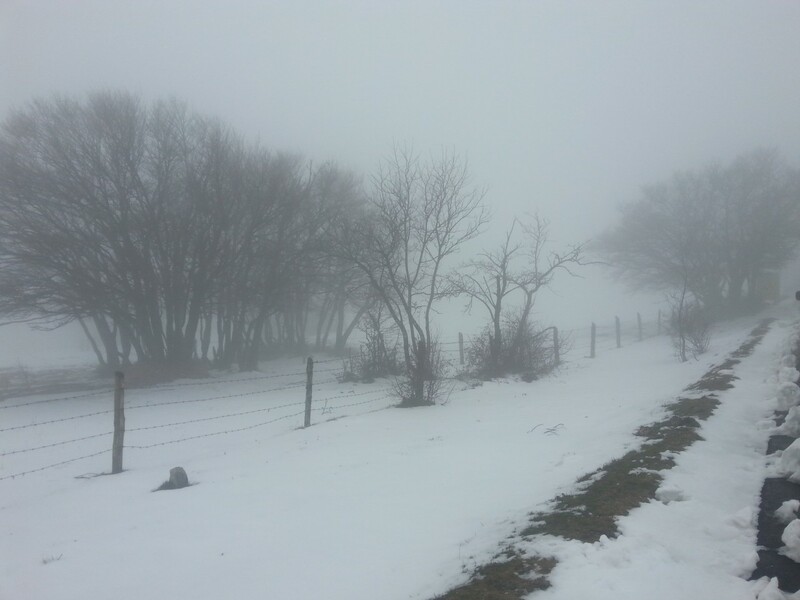 In an effort to equal or upstage the Paris-Nice organisers on every front, this year’s Stage 5, the queen stage from Foligno to Monte san Vicino, was cancelled. More seriously, most commentators in and out of the peloton nodded at the wisdom and sagacity shown by the organizers in annulling the stage before it got under way, not wanting to a repeat of the stop/start spectacle of the eventually-cancelled Paris-Nice stage. However, Vincenzo Nibali wasn’t a happy bunny because of the missing climb, and sent an Astana man up the mountain in a car in an attempt to prove that the road was ridable. He then threw what is, in professional terms, known as a whiny sulky cry fit, saying he might not now ride the Giro. Despite the cancellation, the stage 5 winner must be Matt Brammeier, who mentioned Nibali in the following now-infamous tweet: “better you stay home and skip the whole season you narrow minded, selfish moron”. Stage 6, and we’re back on the bikes and headed towards a short, sharp uphill sprint. But there was a certain caginess amongst the riders on the road to Cepagatti. With the expected G.C. selection in the mountains evaporating overnight like alpine mist, the race had suddenly taken on an entirely other character. It was actually possible that race leader Zdeněk Štybar might wear the leader’s jersey all the way to the Adriatic, and there were other fast finishers and time trial specialists within touching distance of the podium, including Greg Van Avermaet, Peter Sagan, Bob Jungels, and, a third Etixx rider, Gianluca Brambilla. The course ended with three circuits around Cepagatti, with three brief climbs and gradual descents. The closing kilometres were remarkable for technical difficulties with the live feed, meaning plenty of stationary shots of the finish line, but also for the gutsy riding from the key contenders. With 20km to go, an elite group went clear, including Sagan and his Tinkoff lieutenants Daniele Bennati and Oscar Gatto, Štybar and stage 3 winner Gaviria for Etixx, Greg Van Avermaet, and Michal Kwiatkowski. Given the strength in numbers, Tinkoff did most of the pulling, at times only a handful of seconds ahead of a Movistar-led peloton. Greg Van Avermaet barely took a turn on the front, keeping fresh legs for the finish, whilst, strangely, Sagan took his share of turns to keep the break away despite having two teammates with him in the break. The eventual sprint was led out by Kwiatkowski, going long, and Sagan held his wheel as he peeled away. Behind them, Van Avermaet caught their slipstream, and the three led towards the line. Kwiatkowski couldn’t keep the pace around the final bend, and Sagan led GVA towards the fast-approaching line. In only the last fifty metres, Greg Van Avermaet swung past Sagan to take the stage by a matter of inches. Crucially, Štybar came in a few seconds back, and missed out on bonus seconds; GVA took the leader’s jersey, and Sagan was now in third, just behind Štybar. It would all come down to the final time trial. 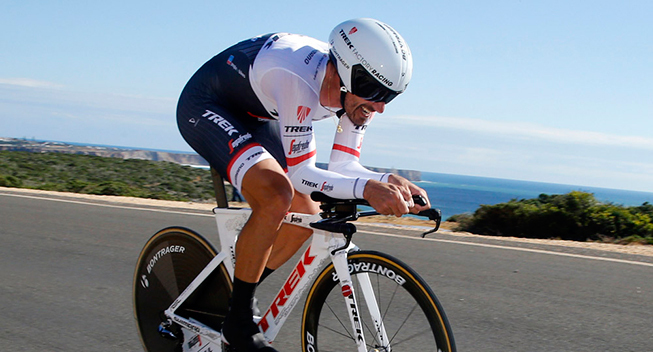 The Stage 7 time trial will be remembered for two dramatic events: one was the enormous effort and powerful performance made by the stage winner Fabian Cancellara. Down on time, Cancellara started his TT about mid-way through the pack. Only a very few riders had come close to the current leader’s time, held by Johan Le Bon for FDJ at 11.21. When Cancellara crossed the line, though, the clock stopped at 11.08. He would be the only rider on the day to beat Le Bon — who is further proof that FDJ have greatly upped their time-trial game — and both riders smashed past the time set by Cancellera the previous year on precisely the same TT course. It’s proof, as if it were needed, that when Cancellara puts his mind to it, big things can and often do happen. What better motivation than one’s last ever Tirreno-Adriatico time trial? The other big drama was, of course, the G.C. battle. If Sagan wanted to beat Van Avermaet overall, he was going to have to take 8 seconds off him in the time trial. There was much discussion of what Štybar might bring to the G.C. challenge, but unfortunately he lacked the power on the day, and he finished 57 seconds down on Cancellara, in 81st position, and dropped to seventh on G.C. It was down to Sagan and GVA, as it feels like it has been all season. Would Sagan be second again? He looked determined on the start line, and raced aggressively across the course. Posting a time 24 seconds down on Cancellara, and 10th on the day, it looked like he’d done it. It was a huge performance, similar to the astounding time trial he pulled out in the Tour of California last year, which he won by a hair’s breadth. But then Van Avermaet appeared in the final kilometres, looking strong and singleminded. As the commentary juggled with the maths and made stabs at predicting the outcome, it was clear that it was going to be a close finish. And then it happened: Greg Van Avermaet crossed the line with less than one second to spare, barely holding on to the leader’s jersey. He’d done it, winning a tour more usually associated with the likes of Alberto Contador and Vincenzo Nibali. Sagan gets second again, but both riders are already looking forward to this weekend’s race, the first monument of the season, and the longest race on the calendar. See you at Milan-Sanremo.